This book explores and details the actuality (Aktualität) of Hegel’s social and political philosophy--its relevance, topicality, and contemporary validity. It asserts--against the assumptions of those in a wide range of traditions--that Hegel’s thought not only remains relevant to debates in current social and political theory, but is capable of productively enhancing and enriching those debates. The book is divided into three main sections. Part 1 considers the actuality of Hegel’s social and political thought in the context of a constructed dialogues with later social and political theorists, including Marx, Adorno, Habermas, and Rawls. Part 2 explores Hegel’s internal criticism of Enlightenment rationality as well as the unique manner in which his thought reaffirms both the classical tradition of politics and the Christian conception of freedom in order to deepen and further develop our understanding of modernity and modern secularity. Part 3 considers Hegel’s contribution to current theorizing about globalization. 1. 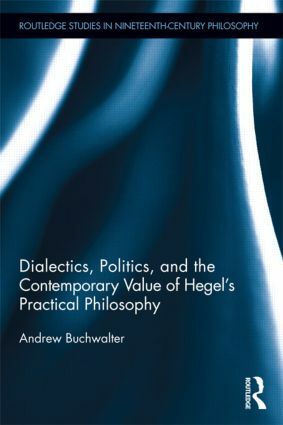 Introduction: Dialectics, Politics, and the Contemporary Value of Hegel’s Practical Philosophy Part 1: Normative Political Theory in Dialogue 2. Hegel, Marx, and the Concept of Immanent Critique 3. Hegel, Adorno, and the Concept of Transcendent Critique 4. Law, Culture, and Constitutionalism: Remarks on Hegel and Habermas 5. Political Pluralism in Hegel and Rawls Part 2: Modernity and Secularity 6. Hegel and the Doctrine of Expressivism 7. Hegel, Hobbes and Kant on the Scienticization of Practical Philosophy 8. Hegel’s Concept of Virtue 9. Political Theology and Modern Republicanism: Hegel’s Conception of the State as an "Earthly Divinity" Part 3: Eurocentrism, Globality, and Interculturalism 10. Hegel’s Conception of an "International ‘We’" 11. Hegel, Global Justice, and the Logic of Recognition 12. Is Hegel’s Philosophy of History Eurocentric? Andrew Buchwalter is John A. Delaney Presidential Professor at the University of North Florida. He was Fulbright Professor at the University of Bochum Germany. He is Vice-President of the Hegel Society of America.